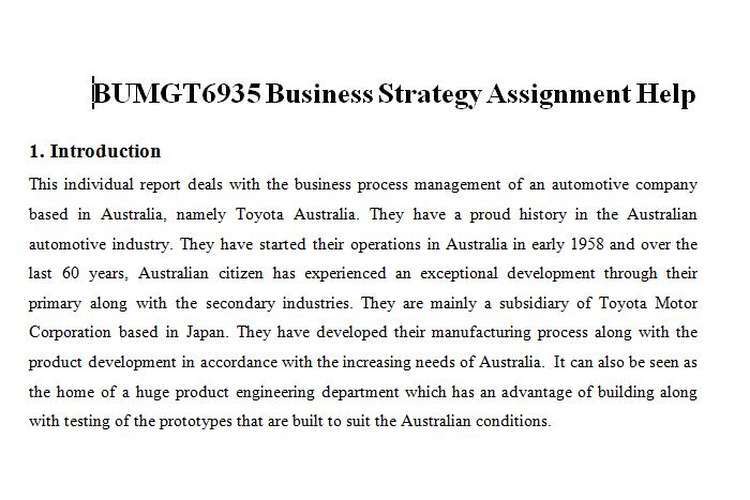 This individual business report deals with the business process management of an automotive company based in Australia, namely Toyota Australia. They have a proud history in the Australian automotive industry. They have started their operations in Australia in early 1958 and over the last 60 years, Australian citizen has experienced an exceptional development through their primary along with the secondary industries. They are mainly a subsidiary of Toyota Motor Corporation based in Japan. They have developed their manufacturing process along with the product development in accordance with the increasing needs of Australia. It can also be seen as the home of a huge product engineering department which has an advantage of building along with testing of the prototypes that are built to suit the Australian conditions. This report deals with certain objectives that can be helpful to understand the various fields of the automotive sector. It also discussed the operational management process of the Australian automotive industry. Through this individual report, the different operational management process along with the strategies can be defined. The report can also be taken into consideration while studying the various aspects of the design of the automotive industry. Organisation's business objectives and operations stratege. The mission of to Toyota Australia is to give safe and sound journey to their customers. They are developing several new technologies from energy saving and diverse energy sources. They are giving the highest priority to the environment and also working to create a healthy environment society and clean world (Toyota About The Company. 2016). Their vision is to become the most respected and successful company who can delight their customers with a vast range of solutions and products in the Automobile industry with the help of best technology and best technicians. The manufacture, sale and repair of motor vehicles along with the industrial vehicles and other transport machinery and their parts. The designing, planning along with the supervision, execution and the undertaking of the various construction works. The information regarding the services, communications along with the information supply and the development of the existing technology. Achieve the success in the sector of inland transportation, air transportation along with the marine transportation. To increase the production and the processing by the biotechnological products. Toyota Australia has incorporated a theory which is mainly designed for the basic heat engine types along with their various engine structure and engine operating life cycle. Toyota mainly constructs three models in Australia. These are Camry, Camry Hybrid along with Aurion. Toyota Australia produces various operations such as manufacturing, investments, exports, sales along with Toyota Production System and building a well-assembled car. In all of their operations, Toyota Australia has taken the Total Quality Management (TQM) strategy into consideration. As stated by Teece (2010), TQM basically deals with five different factors. These are the continuous improvement, quality improvement, accurate measure; provide focus to the customer along with the involvement of the employees. Toyota Australia has managed all of these aspects regarding their different operations. They have also taken the theory of constraints while performing their operations. There are five main steps that Toyota Australia have followed to incorporate this theory (Toyota About The Company. 2016). First, they identified the constraints related to the system. Then they exploit the system's constraints. Next, they subordinate everything else to perform the exploitation decision. In the next step, they elevate the constraints. They have used these steps repeatedly to identify and remove the constraints from the operational strategy. In addition to their ongoing business planning, the transformed strategy was launched in 2011. This will help to reconstruct their business model and provide the guarantee to the profitability issue. They have made a good achievement after completing the first year of the transformation strategy. It provides good productivity along with improved quality, reduction of costs and also provides a proper focus on the local manufacturing. As Casadesus-Masanell & Ricart (2010) explained, the Total Quality Management is a kind of philosophy which mainly deals with the improvement of the processes along with the management of an organisation. Decision-making is the main management activity and the process which is very much vital for the survival and the success of an organisation. Therefore, the efforts of TQM have now largely ignored the decisions regarding the quality made by the management level employees of organisations. It rather provides focus on the traditional value processes. The discipline regarding the decision-making analysis produces the needed tools and processes which can be helpful for making good decisions. The management of Toyota Australia has provided themselves with a proper training in this particular sector along with the tools that are very much essential to reach the state of controlling themselves just they expect from their employees. The management of the decisions can be described as the total effort that is required to reach the good decisions along with the good results. Therefore, if the management wants to guarantee the survival of the enterprise, they have to maintain the quality and the excellence in the sector of the decision making (Vom Brocke & Rosemann, 2010). Toyota Australia at first defined their corporate strategy and then they identified their operational performance objectives which are linked to achieving the strategy. After that, Toyota Australia defined their measure that they used to determine their performance objectives. Then Toyota Australia configures their operating environment to achieve the five operational performance objectives that are speed, quality, dependability, costs and flexibility. According to Matthyssens & Vandenbempt (2010), quality is more than the similarity towards a specification. It also deals with the fact that how a product performs its function along with the reliability of the product. It also refers to the durability of the product. Toyota Australia has maintained the quality performance objective in order to increase their sales. It mainly refers to the rate in which Toyota Australia generate their sales quotes along with that how rapidly they can deliver their products. Mainly speed refers to issues which require time to manufacture one or more products along with the time that the company needed to research and develop a new product. Toyota Australia delivers their products to their customers in time and on the cost which was decided between the two parties. This is the dependability performance objective. It can be also measured by the ability to the product's function which can be used to design to perform continuously a reasonable amount of time (Bharadwaj et al. 2013). In Toyota Australia, they have configured their product lines which can deal with different requirements of the products along with the operations that can adjust to the new requirements very quickly. This is granted as the flexibility performance objectives.? It refers to the change in per unit cost due to the fluctuation in the volume that a manufacturer produces along with the variations of the products that are produced to the customers.? There are three competitive strategies that Toyota Australia have taken into consideration while conducting their operations. These are overall cost leadership which means producing the products of lowest cost in the markets. In addition to that they focus on the market segmentation which satisfies the needs of a particular market. Moreover, they implemented product differentiation that offers such products which differ from the competition. The world is becoming a global village. Therefore the organisations have to compete with their rival organisations in order to sustain in the competitive market. Toyota Australia also had to suffer this challenge (Toyota About The Company, 2016).? If a customer is paying money for something, it should be worthy. Therefore, satisfying the customer needs and understanding the fact that what they actually demand is a big challenge for Toyota Australia.? The ongoing trend in the recent economy was also acted as a challenging factor for Toyota Australia. The current rate of Australian Dollar is a concerning factor for them.? As the day passes by, the technology is also changing. Toyota Australia has to grasp the current technology in order to produce a good quality product or services to their customers.? In order to overcome the challenges that occur due to the globalisation, the operation managers of Toyota Australia needs to create a target market which may keep the originality of the product. In order to manage the customer needs, they should have to interact with their customers through various online or offline surveys. While talking about the technological challenges, Toyota Australia has to incorporate a skilled set of employees into their organisation and have to train them about the recent technologies. The report on Toyota Australia has managed to gather information regarding their operations in the automobile field. They have gathered a target audience and based on them they are dealing with their products. This study also reveals the facts that how Toyota Australia have managed their set of operations and the business strategies. It also reflects the part of the various operation management principal that are adopted by Toyota Australia in order to increase their sales. Along with that the report also discussed the challenges and the possible suggestion which Toyota Australia can acquire in order to mitigate those challenges. Bharadwaj, A., El Sawy, O. A., Pavlou, P. A., & Venkatraman, N. V. (2013). Digital business strategy: toward a next generation of insights. Mis Quarterly, 37(2), 471-482. Krajewski, L. J., Ritzman, L. P., & Malhotra, M. K. (2013). Operations management: processes and supply chains. New York: Pearson. Matthyssens, P., & Vandenbempt, K. (2010). Service addition as business market strategy: identification of transition trajectories. Journal of service management, 21(5), 693-714. Teece, D. J. (2010). Business models, business strategy and innovation.Long range planning, 43(2), 172-194.